Current business environment requires companies to provide continuous services delivery, independent of any outages. To ensure constant uptime for applications, companies distribute the workloads among remote locations such as different cities, countries or even continents. In order to assure high availability for the company’s mission-critical applications, StarWind brings in active-active Stretched Clustering support. While a stretched cluster is not a new technology, typical solutions offer active-passive replication which is not efficient because only a half of resources can be used for the applications, while the remaining part remains inactive. Moreover, it is crucial for any business to keep its mission-critical applications always up and running. This creates a need in a solution that allows avoiding any outage to the production environment. Analysis of this issue led to the elaboration of an active-active data replication between various locations. This implies that all the sites of the stretched cluster are running simultaneously and holding the entire actual data. Therefore, in case there is a power outage in the city A, the IT infrastructure will not suffer any downtime due to the workload mirrored to the city B.
StarWind ensures business continuity and constant uptime for applications and services by offering Stretched Clustering support. Utilization rate of the IT infrastructure attains 100 % as StarWind Stretched Clustering features active-active configuration of the replicated shared storage. What is more, companies can avoid the downtime since Live Migration between geographical locations takes place in case something happens to one of the sites. Furthermore, the process of cluster administration becomes much easier with such management tools as StarWind Management Console, SCVMM, and 5nine Manager. 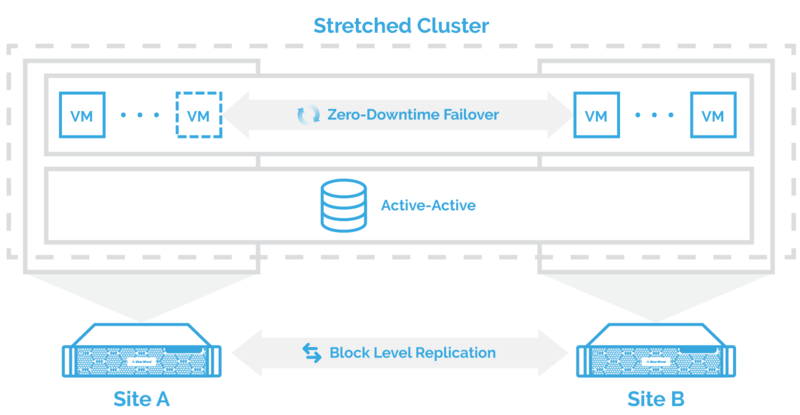 StarWind Stretched Clustering ensures 24/7/365 applications uptime by introducing active-active shared storage replication between distant locations. Moreover, IT infrastructure is utilized at its highest potential so that no resources are left on standby. Along with convenient management tools, the StarWind-powered stretched cluster becomes a perfect solution for maintaining business continuity without undermining simplicity.